Author Terry Sidford reveals stories of ordinary women who found extraordinary courage in the face of heartbreak and peril. Was there a defining moment that made you who you are today? 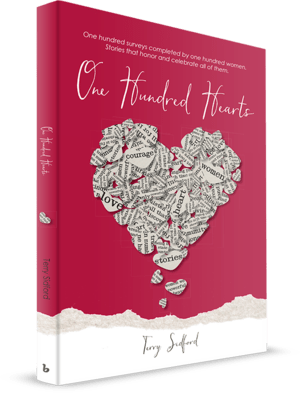 One Hundred Hearts shares the deeply introspective responses to these and other questions answered by one hundred women. Through their answers, stories of ordinary women and their extraordinary courage come to life. You’ll laugh with them, cry with them, and see yourself in their journeys. Individually, the women you meet in this book display incredible courage. Collectively, they inspire you to appreciate the courage you demonstrate in your own life on a daily basis.